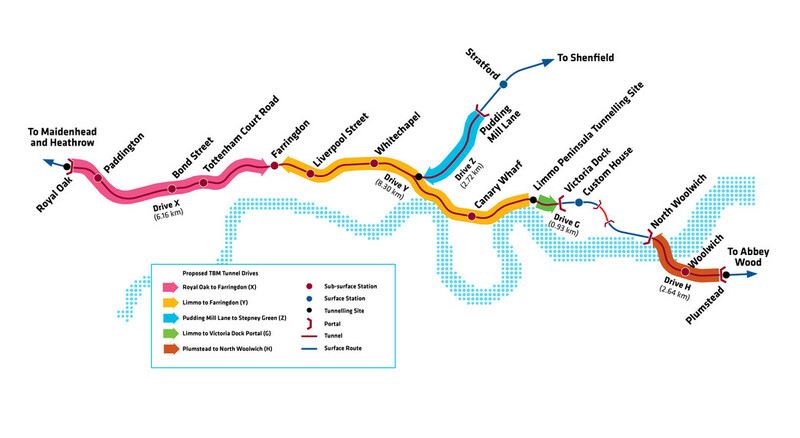 Railway tunnels - Crossrail . For information about the Elizabeth line please visit the Transport for London website. Crossrail's tunnelling marathon began in May 2012 and ended at Farringdon in May 2015 with the arrival of tunnelling machine Victoria. For three years, eight 1,000 tonne tunnel boring machines (TBMs) have bored 42km or 26 miles of new 6.2 diameter rail tunnels under London. The machines were operated by “tunnel gangs” of 20 people, working in shifts around the clock to construct the tunnels, carving out around 3.4 million tonnes of earth. Tunnelling machine Victoria, named after Queen Victoria who oversaw the birth of modern railways, successfully broke into Farringdon Crossrail station on 23 May 2015 at 5.30am. Victoria then constructed the remaining section of Crossrail tunnel as she progressed into Farringdon station, completing the job and linking all Crossrail tunnels. TBM Victoria completed her journey on 26 May 2015 when Crossrail tunnelling ended. Over eight million tonnes of earth has been excavated by Crossrail during the construction of the new rail, station and platform tunnels. Much of the excavated material was used to create a wetland habitat for birds in Essex. Crossrail began building its first tunnel in May 2012 when the first pair of tunnel boring machines (TBMs), Phyllis and Ada, started tunnelling at Royal Oak in west London. Our eight TBMs undertook a total of ten individual tunnel drives to construct 21 kilometres or 13 miles of new "twin-bore" tunnels. The pair of tunnels, one each for eastbound and westbound services, stretch from a portal at Royal Oak in west London, running at depths of up to 40 metres under the West End and the City of London linking up Crossrail’s central stations, before splitting into two routes in east London. In the north east the tunnels continue to a portal at Pudding Mill Lane. In the south east the tunnels run to Victoria Dock portal and then under the Thames to Woolwich. The precise route of the tunnels was chosen after extensive surveys were undertaken to consider the potential impact on many thousands of buildings above the route, including hundreds of listed buildings. The route had to weave around foundations, existing Tube lines, sewers, utilities and other underground infrastructure. At Tottenham Court Road, one of London’s most congested underground locations, the route had to be built within a metre of an operational Tube platform. Royal Oak to Farringdon west (Drive X) - two 6.8km rail tunnels, constructed by tunnelling machines Phyllis and Ada, were completed in October 2013 and January 2014 resepctively. Limmo to Victoria Dock Portal (Drive G) - Tunnelling machines Jessica and Ellie have also completed their second tunnel drives - a 900 metre drive from Limmo Peninsual in Canning Town and Victoria Dock Portal. The tunnels surface via newly constructed tunnel portals at Royal Oak, Pudding Mill Lane, North Woolwich, Victoria Dock, and Plumstead. Over 200,000 concrete segments were required to line the 42 kilometres of running tunnels. Seven segments and a keystone were used to make up every tunnel ring, locked together to build a concrete tube reinforced with steel fibres, built to last for hundreds of years. 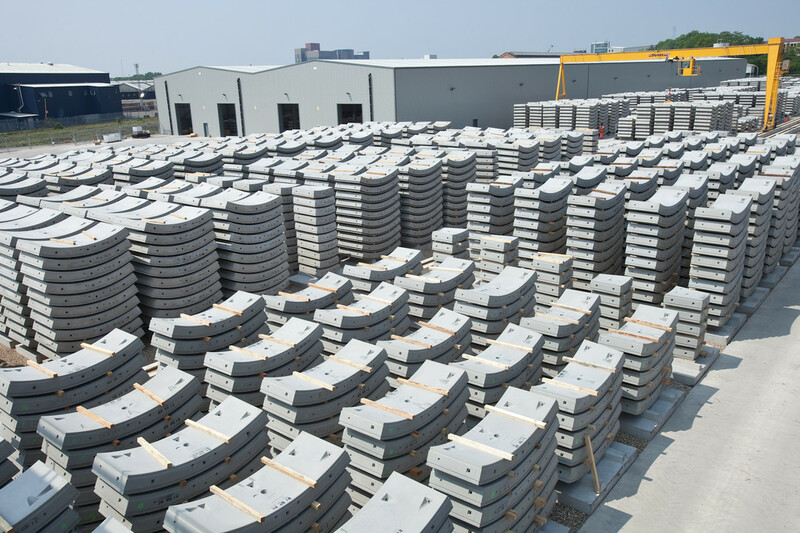 Each segment weighs 3,000 kilogrammes and each keystone weighs 1,000 kilogrammes.